One guy told us that he would do us a “favor” and butcher him in our yard and share the meat! He said that it would be easy to kill him because the pig comes right up to people, without fear or aggressiveness. He wanted to shoot him in the head, hang him on our daughter’s swing set and slice him up before she got home from school. 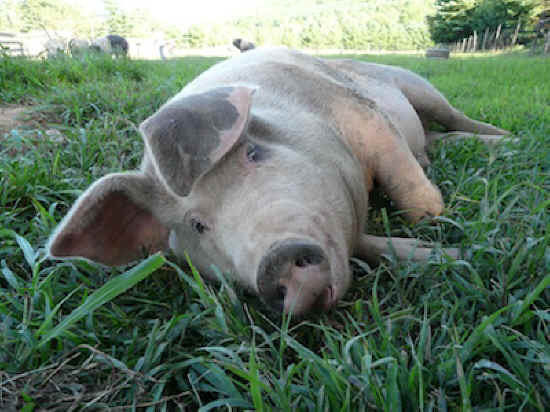 In August, 2010, we took in a young pig rescued from a neglect case. He immediately fit in with the herd and LOVES people — you can pet him for hours, and he looks you right in the eye with an appreciation you can feel inside. Here is the story of Little Dude as told by his original rescuers, Dawn and Jerry, down in New Jersey. Dude and his brother were brought to our neighborhood by a man who was friends with our neighbor. He was raising them to be butchered & keeping them there temporarily until he found a more permanent place for them. After about a week, we couldn’t help but notice that they were screaming constantly. We went to see them and find out what was going on and saw two scrawny little piglets. We immediately went back to our house to gather up some food for them, thinking they may be hungry. After a few weeks, we still were sneaking over to continue to feed them as much as possible, the poor little babies were starving!! We decided to take it upon ourselves to call the vet and have him take a look at the pigs, but one of them ended up dying anyway. Another week or so went by, and we were still sneaking food over to “Dude.” Jerry confronted the owner again and again to take care of this little pig or we would take him away and call authorities. The owner was reluctant to let us take the pig, he wanted to eat him the way he was!!!….. only about 2 months old !! Well…..we took him ! We provided the best possible home we could by converting one of our sheds into a pen. He had a pretty big indoor area and a fenced in outdoor area. Dude kept going through the fencing and escaping into neighbors’ yards, of course, when we were at work. Unfortunately, animal control got involved several times. They warned us that if we didn’t contain him we would have been taken to court, fined, and they would have taken the pig to be put down — or shall I say eaten! We put up an electric wire fence to contain him into a smaller yard. He was not happy and neither were we. Before we knew it, we had many strange people knocking on our door to take the pig. Apparently animal control put out the word that we needed to find Dude another home. These strange people all wanted to “take him off our hands”. We found out that every person that came to us had plans on either a pig roast, or butchering him themselves. Despite all this we were able to keep him for just over a year and it got to the point where it was clear he would be safer at farm sanctuary. We are so thankful that you agreed to take him. This really is the short version of the story, otherwise I could write a book ! You have no idea what we and Dude have been through. We are soooooo happy he has a wonderful home !! !